The oft-delayed NPOESS Preparatory Project, once a symbol of bureaucratic mismanagement, is back on track for liftoff in October on an essential mission to supply weather and climate data to meteorologists. Photo of a "pop-and-catch" partial deployment test of the NPP solar array in September 2010. Credit: Ball Aerospace and Technologies Corp. The U.S. weather satellite is more than halfway though a series of environmental tests to verify the craft's ability to withstand the harsh conditions of rocket flight and low Earth orbit. Originally planned to launch in 2006, the NPP satellite was conceived as a research and technology demonstration mission. But cascading delays of the country's next-generation polar weather satellites thrust NPP into a make-or-break role as an operational asset for forecasters. NPP was the victim of a cumbersome, ineffective management structure and development delays of its suite of weather and climate sensors. 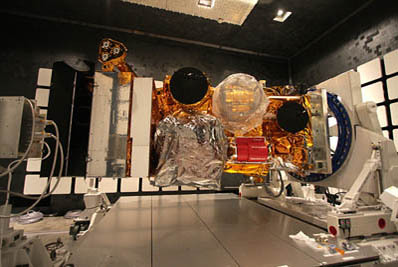 The satellite's last instrument was installed in July 2010, setting the stage for environmental tests in the fall and winter. "We're on track to launch this October," said Ken Schwer, NPP project manager at NASA. NASA oversees the acquisition and development of civilian weather satellites, while NOAA operates the observatories once they reach orbit. A launch mishap or premature satellite failure could spell major trouble for forecasters relying on polar satellite data to observe global weather patterns, study the changing climate, and measure temperature, moisture and ozone levels around the world. The data are fed into climate models to help produce short-, medium-, and long-range forecasts for civilians and the military. NPP will also continue long-term climate research now being conducted by NASA's Terra, Aqua and Aura remote sensing satellites. NOAA, the U.S. Defense Department and Eumetsat, the European weather satellite organization, share responsibility for collecting climate observations from polar orbits. The agencies operate spacecraft in different orbital planes spread around the globe at any given time. The U.S. military provides satellites flying over parts of the Earth in the early morning, Europe oversees mid-morning coverage and NOAA assets do observations in an afternoon orbit. The polar-orbiting satellites complement observatories at geosynchronous altitudes, which provide real-time imagery to track severe storms, hurricanes and other rapidly-developing weather systems. The higher-altitude satellites also beam back imagery seen on television newscasts. NPP is heading for the afternoon orbit, where NOAA has three satellites available to collect weather data. But two of those spacecraft are aging and only partially operable. NOAA 19, the agency's newest polar satellite, was launched in February 2009 and designed to work for more than three years. NASA expects NPP will be ready to launch as soon as Oct. 25 on a Delta 2 rocket from Vandenberg Air Force Base, Calif. It is scheduled to be the final flight of the Delta 2. "It's not a real tight schedule," said Preston Burch, manager of the Joint Polar Satellite System program at NASA's Goddard Space Flight Center in Greenbelt, Md. The JPSS office was opened at Goddard last year to replace the civilian portion of the cancelled NPOESS program. The troubled NPOESS program attempted to combine civil and military polar weather satellites, but the effort fell years behind schedule and billions of dollars over budget. The cost of NPOESS soared to more than $15 billion by the beginning of 2010. The U.S. government called it quits on NPOESS last year, opting to go back to the tried-and-proven concept of separate defense and civil programs. Officials at Ball Aerospace and Technologies Corp. in Boulder, Colo., say the NPP spacecraft has completed a series of integrated dynamics tests simulating the violent environment of a rocket blastoff. According to Schwer, the satellite also finished up electromagnetic interference testing earlier this month. Next up is a thermal vacuum test to subject the spacecraft to the extreme heat and cold of space. Schwer said the project has about 40 days of schedule slack to address potential last-minute problems before they impact the October launch target. "We're maintaining schedule very well and have been very successful throughout the environmental [test] campaign," Schwer said. "We're working very well with the JPSS ground system. We have all the interface and compatiblity testing lined up. It looks like we have a very good path to get to that October 2011 launch." NASA's focus since restructuring the weather satellite program has been on accelerating the development and testing of a common ground system. The new ground system, a holdover from the NPOESS program, will be first used by the NPP satellite once it is safely in space. Future Air Force satellites will also rely on the JPSS ground system for spacecraft control and data collection. "The ground system is absolutely enormous," Burch said. "Right now, our No. 1 priority is getting the JPSS ground system ready to support the NPP launch." Managed by Raytheon Co., the ground system encompasses crucial command, control, communications, data processing and operations functions. Officials rushed to prepare the ground system for integrated testing with the NPP spacecraft. "The ground system needs to participate in that [testing]," Burch said. "It's an opportunity to test the spacecraft with the ground system to ensure compatibility. Raytheon has been working very hard to get these issues identified and fixed and be in a position to run all the tests with the spacecraft." The Government Accountability Office, a federal watchdog agency, last year identified the NPP ground segment as one of the highest risks still plaguing the program. Budget overruns last year forced managers to temporarily scale back work on the ground system, slowing progress in the latter half of 2010. But officials have made up for lost time since that setback. "Right now, we've got the ground system back on track to support the NPP launch," Burch said. Compatibility checks between the Raytheon ground system and the NPP spacecraft are planned for the coming months. If those tests go well, engineers will prepare the satellite for its final exam -- several weeks inside a thermal vacuum chamber designed to subject NPP to the airless environment of space. Officials expect to ship the spacecraft in August from Boulder to Vandenberg Air Force Base for launch preparations. 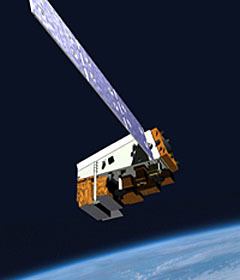 Artist's concept of the NPP spacecraft in orbit. Credit: Ball Aerospace and Technologies Corp.
"We have confidence that we're going to hit the Oct. 25 launch date," said Scott Tennant, NPP program manager for Ball Aerospace. Ball's development of NPP was managed by Northrop Grumman Corp., the prime contract of the NPOESS program until it was disbanded in 2010. Northrop Grumman answered to the NPOESS Integrated Program Office, a tri-agency oversight organization that included the Air Force, NOAA and NASA. The acquisition and launch of NPP and future JPSS satellites will now be managed by NASA, much like the heritage weather satellites the new craft are replacing. The cumbersome tri-agency structure was blamed for rising costs and mounting schedule delays facing the NPOESS program. NPP fell victim to similar problems, falling more than five years behind schedule since 2002. Officials blame technical snags with NPP's weather instruments for most of the delays. The last of the satellite's five sensors was integrated on the spacecraft in July 2010, finally clearing the way for NPP's final environmental tests and launch campaign. According to Christian Meyer, NPP's chief engineer at Ball, assembly of the spacecraft bus was completed in 2005. The extra time didn't go to waste. While waiting for instrument deliveries, the Ball team put the NPP spacecraft through extra tests to raise engineers' confidence in its performance. "There was a lot of risk reduction testing with the instruments, risk reduction testing with the ground control station back in Suitland, Md," Meyer said. "That's how we filled in the gap to a large extent." Workers bolted dummy instruments to the satellite and put the observatory through a series of functional checks, including verifying new 1394 data bus technology. "We reduced as much risk as we could in terms of the instrument interfaces and the overall system operability," Meyer said. "We actually upgraded the spacecraft in a few different areas." 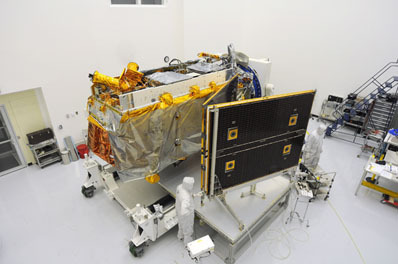 The Visible/Infrared Imager Radiometer Suite, or VIIRS, was delivered to Boulder in January 2010. The Cross-track Infrared Sounder, or CrIS, was plugged into the spacecraft in July 2010. Circuit card design flaws in the CrIS instrument forced NPP's most recent launch delay. Rework on CrIS was responsible for a nine-month delay, according to NASA. CrIS was manufactured by ITT Geospatial Systems. Engineers designed NPP for at least five years of service in space, but officials expect the satellite to function into the second half of this decade. That might be necessary given the possible complications in the development of the first JPSS satellite, which would take over for NPP in NOAA's afternoon polar orbit. NASA and NOAA selected Ball to provide a clone of NPP as the first next-generation climate satellite, surmising it was the least risky solution to close the weather satellite gap. JPSS 1 won't launch until at least 2015, and possibly later depending on technical progress and the flow of government funding. An early end to NPP's mission or major delays in the JPSS schedule could spell trouble for weather forecasters, a dire outcome the GAO and others have warned of for years. The stakes aren't lost on weather satellite officials. "A major concern with restructuring NPOESS was ensuring that we minimize the risk of any potential gap in weather coverage in the afternoon orbit," Burch said. "NOAA is kind of thin on assets in that orbit, so we want to get the first JPSS spacecraft launched as soon as possible." "NPP will be the weather satellite for our nation for the next several years," Meyer said. "We take our role seriously."